Volendam the fisherman village is really nice, the view is beautiful, when you look into the sea you will see a lot of white sails just like you see the cotton in the swimming pool. Actually Volendam is a small town in North Holland in the Netherlands, in the municipality of Edam-Volendam. Volendam is a good recreation place and is popular tourist attraction fishing boat, where you could go sailing, swimming, surfing or discover the beautiful view surrounding, and also popular with the traditional clothing still worn by some residents. FC Volendam is a football club based in Volendam. Volendam has a nice smell different with the other fisherman village where you smell fish aroma, in Volendam you will see a lot of nice houses, shops and nice hotels, and there are some cafes sell seafood products really yummy. In Volendam the peoples won’t missed to have photo with folklore customes, just for memorable to take back to their own countries as a mark that I just have been in Volendam the Netherland. Tourist also like old fisherman’s interior and the sigar band house could be found in Volendam Museum, you can take a boat or ferry to Marken to visit Marken Museum. If you want to stay at Volendam you could stay at the beautiful Hotel Marinapark Volendam, they provide delicious foods and charge reasonable price for rooms, or will you buy a house at Volendan Real Estate? Below is the video we took at Volendam, this video become popular because some companies use it for their advertisement, have you seen it? Belitung is a second biggest island in the Province of Bangka Belitung in Republic of Indonesia, and the province of Bangka Belitung is located between Borneo Island and Sumatra Island. Formerly Bangka Belitung attached to Province of South Sumatra, then the peoples of Bangka Belitung asked the central government of Republic of Indonesia to separate have them separated from the province of South Sumatra. Bangka Island and Belitung Island are riches with tin produce, their tin produce are famous around the world, but unfortunately some area have disturbed by the mining activities, and could lead to the environment hazards. Belitung Island is very beautiful with big boulder of granite, coral and white sandy beach, especially at Tanjung Tinggi, a part of beautiful white sandy beach, you should visit Tanjung Tinggi and enjoyed spectacular sunset. How to get to Tanjung Tinggi? From your country you should fly to Jakarta, the Capital City of Indonesia, then from Jakarta you should fly to Tanjung Pandan, the capital of Belitung Regency, flying time approximately 1 hour, you could stay at City of Tanjung Pandan or Tanjung Tinggi village. The travel time from Tanjung Pandan to Tanjung Tinggi about 30 minutes by car. You could stay at Lor In at Tanjung Tinggi, this accommodation is quite comfortable and provide a good and delicious foods, the price of room reasonably cheap, the view is spectacular, extra ordinary beautiful. You may sail to the beautiful islands surrounding Belitung island, you could charter the boat with reasonable cheap price. You could go to Pulau Lengkuas where the light house located, the journey will take about 40 minutes from Tanjung Tinggi, this light house was build during the Dutch colonialism era around 1889. In the video below, you will see the moment when we sailed to Pulau Burung or Bird Island, you will see the stones formation were stacked made a bird’s head formation. Amsterdam is the capital and largest city of the Netherlands, located in the province of North Holland. The city has a population approximately 747.000 based on 1 January 2008 registration. Amsterdam lay on the river Amstel, terminates in the city center into a large number of canals. Amsterdam is situated 2 meters above the sea level. The surrounding land is flat and it is formed a large folders. Amsterdam enjoyed a temperate climates, winter temperature are mild, seldom below zero degrees, while summers are warm and rarely hot. The main transportation in the city is by bicycle because the Amsterdam is the most bicycle friendly city, some people use boat as their transportation mode because some canals crossing the city so the people could move from one place to another by boat, some people living in a house boat berthed along the canal. The Netherlands is famous with Tulip Flowers, and this Tulip Flower become an icon of the Netherland, also you will find a lot of windmills as the energy resources, that way the Netherlands is also called Windmills country. Below is a video taken at the Canal cruise when the author visited Amsterdam. 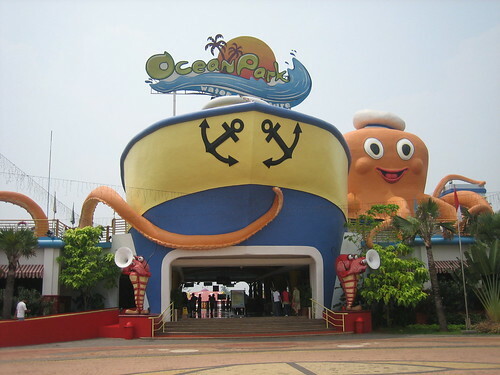 Ocean Park BSD City is a new waterpark arena for children recreation are in operation at BCD City an independent city at Serpong region, Banten Province, Indonesia. 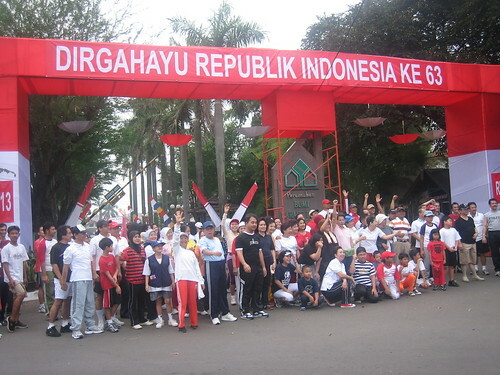 Ocean Park BSD City is close to Swiss German University a famous University located at German Center BSD City. For traveler from Jakarta via Taman Mini to Pondok Indah toll road, you could drive up to the end of toll road and exit at Serpong gate, follow the right lane and follow that road to BSD City Junction, before you reach ITC BSD City or BSD City Junction you will see at the right hand side Ocean Park BSD City arena. For traveler from Jakarta Merak toll road, you have to exit at Serpong gate and follow the sign, you keep driving until you reached ITC BSD City then turn right, at the right side you will see the BSD City Junction, you keep driving along that road until you see the Ocean Park arena at the left side. 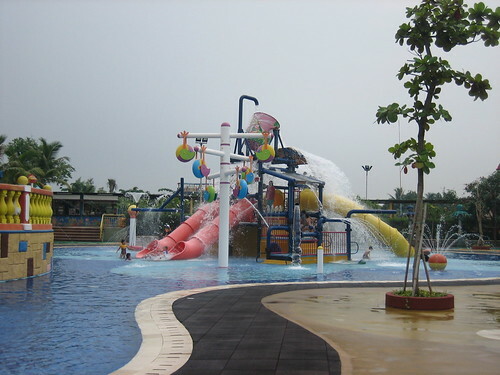 Ocean Park BSD City arena provided baby swimming pool, where your baby could play in that area without fears of accident because the water is shallow and the parents could get in to the pool too. Ocean Park BSD City arena provided wave pool where it is waving like the sea wave, water in the bucket where they fill up the bucket with water and then they pour it to the pool, flowing ditch where the water keep flowing like in the river, Ocean Park provided some sliding arena for the people to slide from the height to the pool. Ocean Park BSD City arena open:Friday to Sunday at 07:00, entrance fee Rp60,000 or US$7.00, Monday to Thursday at 10:00, entrance fee Rp30,000 0r US$3.50, children below 80 cm height are free, but during the weekend and holiday you could get buy two tickets and pay for one ticket only if you pay with Mandiri Credit Card. Should we do exercise on traveling? Yes, it a must to do exercise before traveling, on traveling or when we arrive at the final destination, whether you travel by car, by train, by ship or by plane. 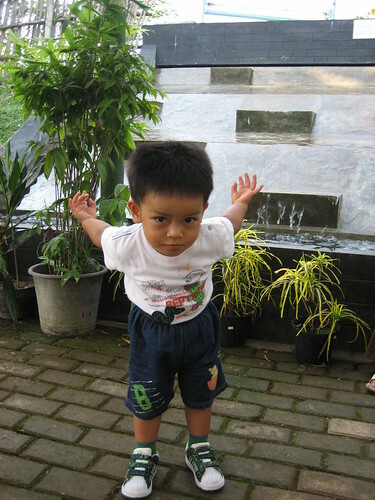 Exercise is an important thing to do, we must stretched our muscle to let our blood flow smoothly to all of our body, like in the picture my cute 2 years old grandson doing exercise before we traveling. We usually do exercise before we traveling, if we traveling by car then every two hours we have to stopped at the rest area, have a rest for a while do an exercise to release the tension, and don’t forget to drink water. When you traveling by plane especially long haul flight, say you travel from America to Asia, the journey will take more than 10 hours, you must have an exercise at the alley, you could walk around while stretching your muscle, and make your blood flow smoothly, have you ever heard an economics class flight syndrome? When you are sitting on your seated for a longtime, your leg muscle stay static, your blood will drop to your leg, it could caused blood clogging in your venous (venous thromboembolism/VTE) in your lung. This clogging will prevent blood circulation to your entire body especially your brains, it could caused blood vessel burst in some parts of your body, it is deadly if clogging happened at your brain. 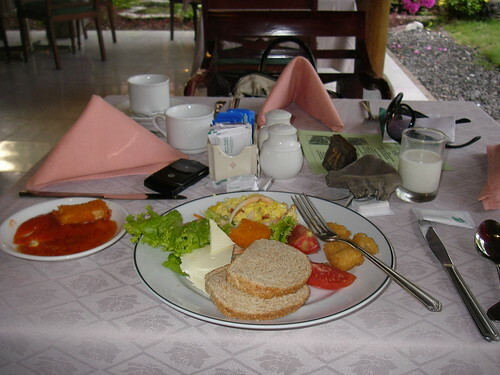 Should you have breakfast before traveling? The answer is definitely yes, because breakfast will give you energy to do your daily activities, especially when you are traveling you need more energy, you must stay healthy. 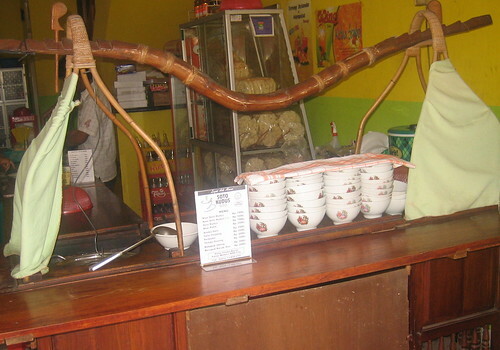 For breakfast you must balance your diet, it is better to have diversification. You don’t have to eat a lot of food but you must eat healthy food with a right combination. You could have toast, omelet, cheese, backed potatoes, tomato, green vegetable, smoke beef and drink milk or orange juice plus a cup of coffee or tea will be good for breakfast. Some people ignoring breakfast, they just simply drink coffee and smoke cigarettes and will eat during the lunch time because he won’t feel sleepy, actually those people’s opinion are totally wrong. 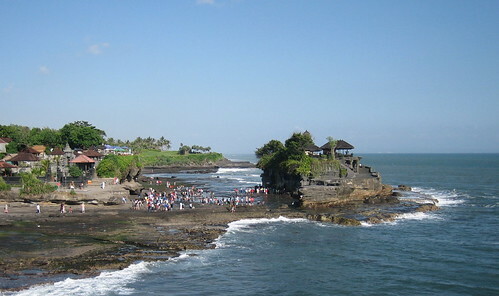 Tanah Lot Temple located at the southern part of Bali, at Beraban Village, Kediri sub-region, Tabanan Regent. Tanah Lot Temple about 13 km from Tabanan or about 25 minutes from Seminyak Village. Tanah Lot Temple that just out in the ocean, you can walk to to the Tanah Lot Temple when the sea at the low tide condition, otherwise the sea water will cover the land. Tanah Lot Temple was build by the people in the village, after they visited by the Holly People Danghyang Nirartha around 1489 A.D, who advised the people to build a Temple for worship. Temple or Pura or Kahyangan namely Pura Pekendungan and now more popular with Pura Tanah Lot or Tanah Lot Temple in English. The entrance fee about Rp 7,500/pax for domestic tourist and Rp 10,000/pax for foreigner tourist, just for your information the exchange rate for 1 US$ equal to Rp 9,000. From the parking space to the Temple you will see a lot of art shops or cafes, so you may purchase some souvenirs from Bali, the Island of Heaven.